Schylling Sunbeam 1000 Record Car. A fantastic model to add to any collection. 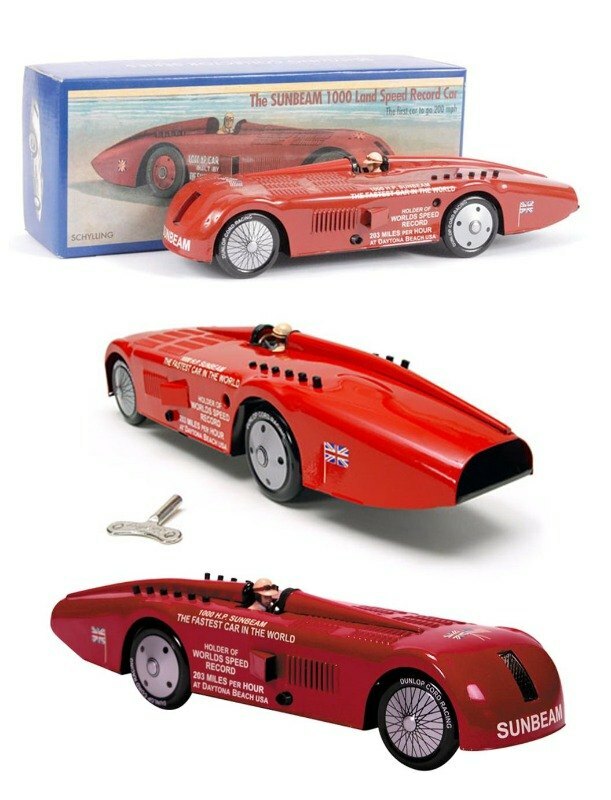 Schylling Sunbeam 1000 Record Car - boxed, complete with original key. (More images below). Overall - mint condition including as new box and information booklet. 28cm long. The Sunbeam 1000 was an incredible car, powered by two 12 cylinder aircraft engines of over 22,000 cc and 500 horsepower each. It weighed over three tons, and on March 29, 1927, in front of a crowd of 35,000 at Daytona Beach, Florida, it set a new world land speed record of 203.792 miles per hour. The car was manufactured at the Sunbeam Motor Company’s Moorfield Works in Wolverhampton,England, exclusively for British driver Major Henry Segrave, whose record achievement made him an instant celebrity worldwide. Typical production cars of 1927 had engines of 20–50 horsepower and the concept of traveling 200 miles per hour was only a dream of science fiction. The design of the Sunbeam 1000 was equally amazing, with a sleek aerodynamic shape that appears contemporary even today. The Sunbeam 1000 with its wind-up motor includes a rich history of the quest for speed, and is a great addition to any tin collection.